Later on, chronic gout can frequently lead to kidney stones, joint erosions and deformities, large visible joint and soft tissue tophaceous deposits, and even kidney failure. 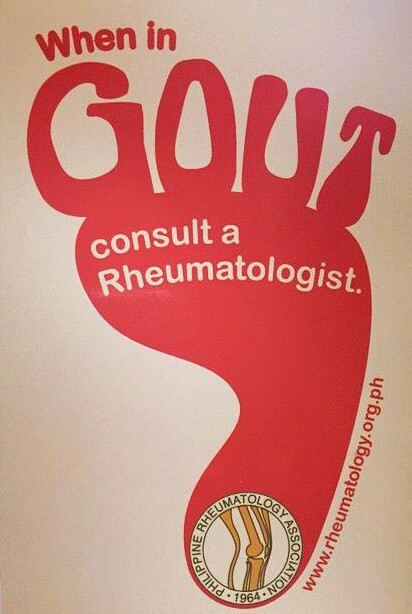 The Philippine Rheumatology Association Gout Awareness Campaign seeks to bring to the public greater awareness of Gout as a disease entity, and encourage proper prevention and treatment, in particular by visiting a Rheumatologist in addition to their usual physicians. Previous PostActive and Latent TB in Persons with Rheumatic Diseases (SIG 2014)Next PostThere’s a Lupus Nephritis Forum on July 24!